It is April 2014 and I made only 1 New Year’s Resolution on New year’s Day. I wanted to finish one UFO each month during 2014. 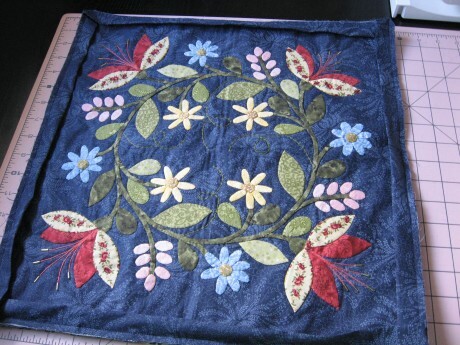 My finished UFO for April 2014 is the Aurifil 2012 Designer Block of the Month quilting. 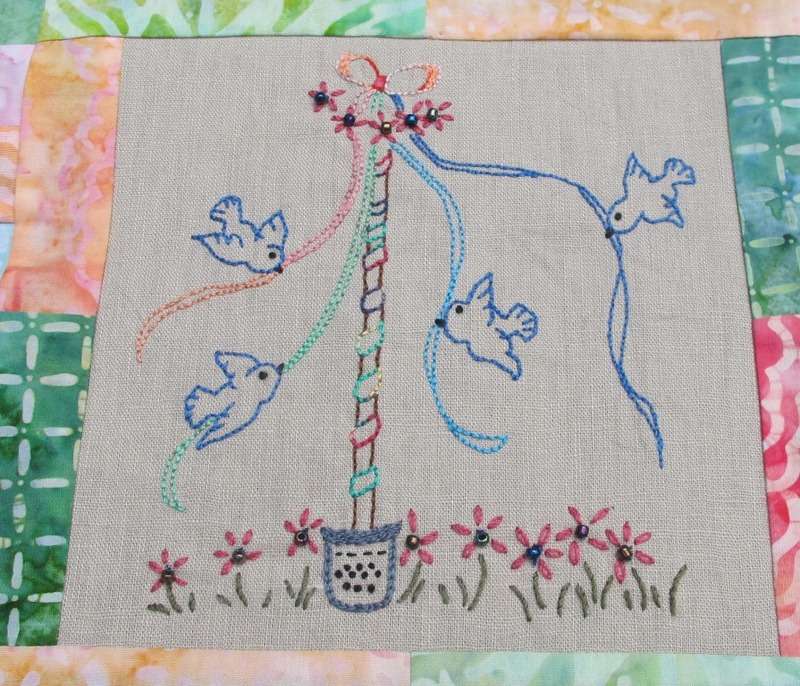 It has taken me a while to actually do the quilting as the top was traveling with Jenny on several ‘guest speaker’ engagements and it also was displayed at the AQM last November. 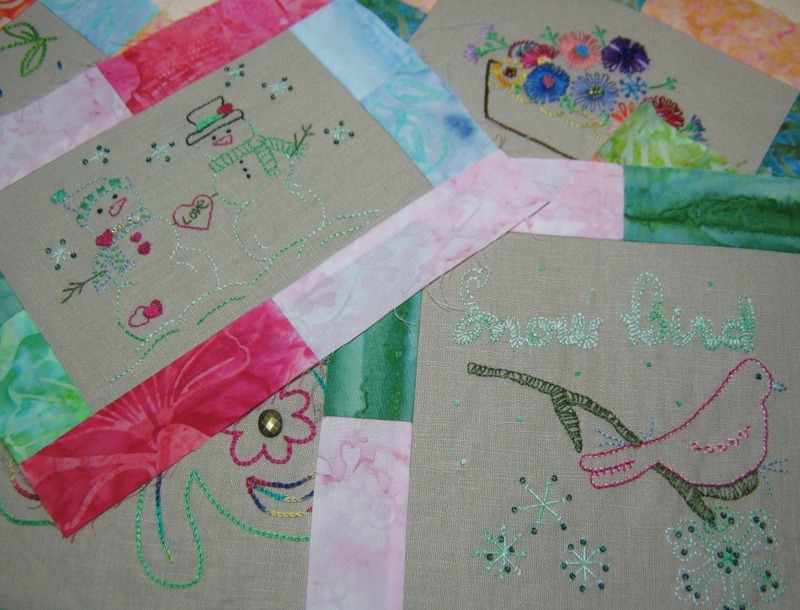 Then…there was the dilemma of ‘how to quilt it’. 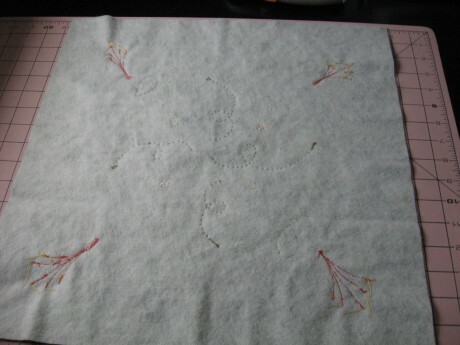 Jenny uses a lovely flower pattern when quilting using her Gammill Classic at Always Quilting. 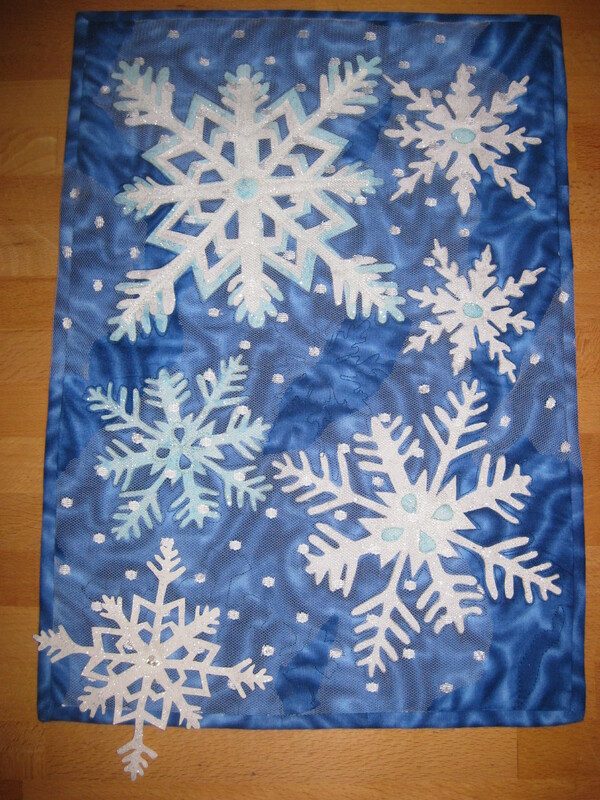 I practiced for days on my domestic machine until I was happy with the flow of the design. 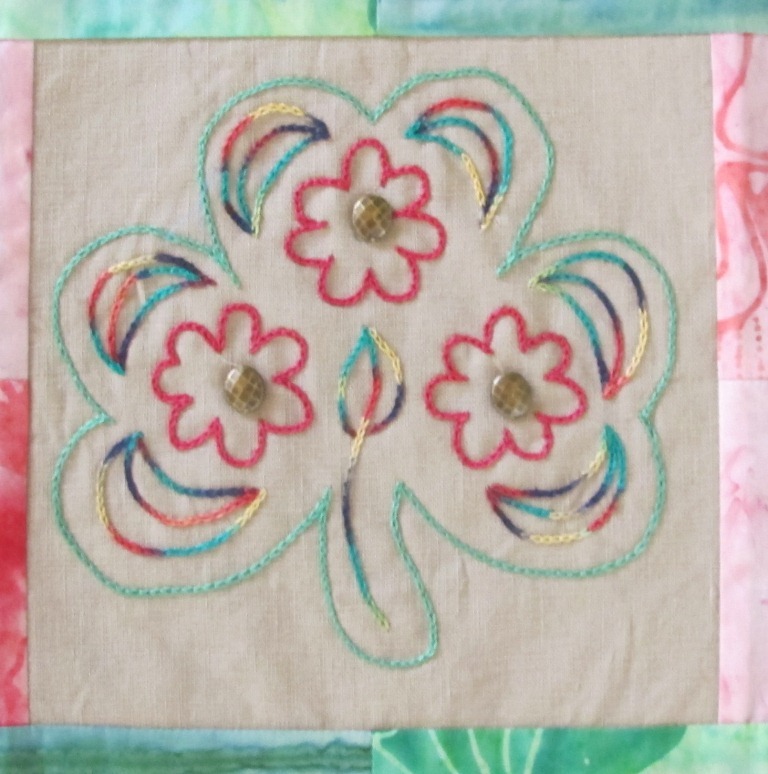 I have quilted my free flowing flowers using Free Motion Quilting (FMQ). 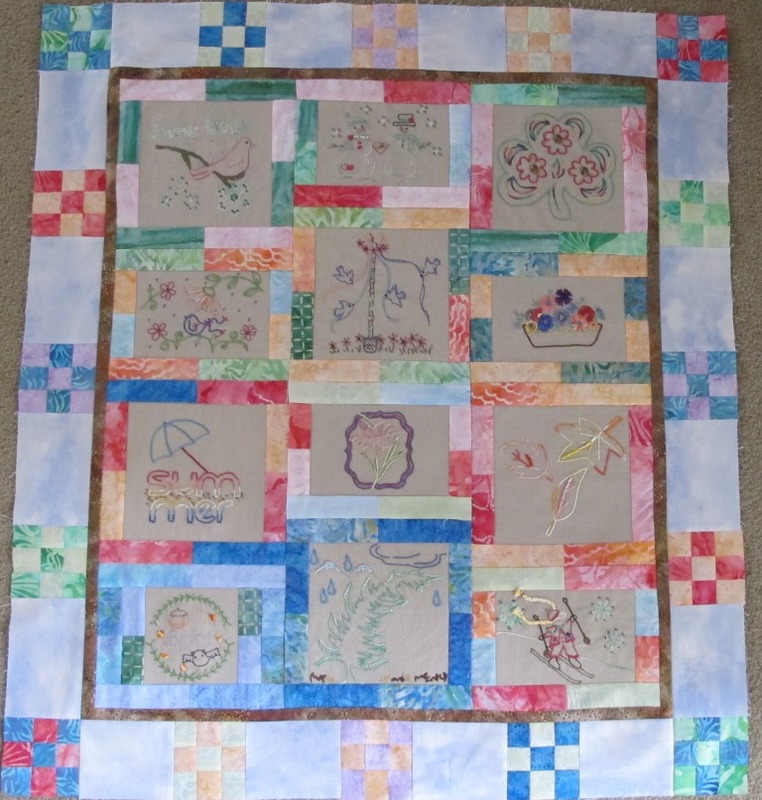 I think it complements the June block. 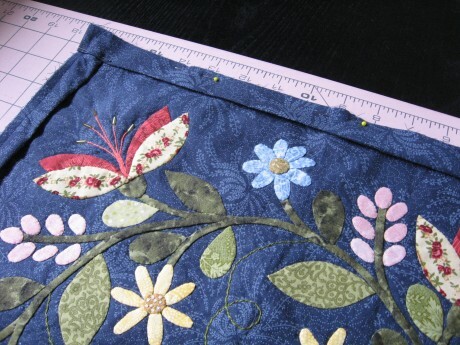 An Aurifil blogger, Lori Kennedy, has a wonderful site with many FMQ tutorials. 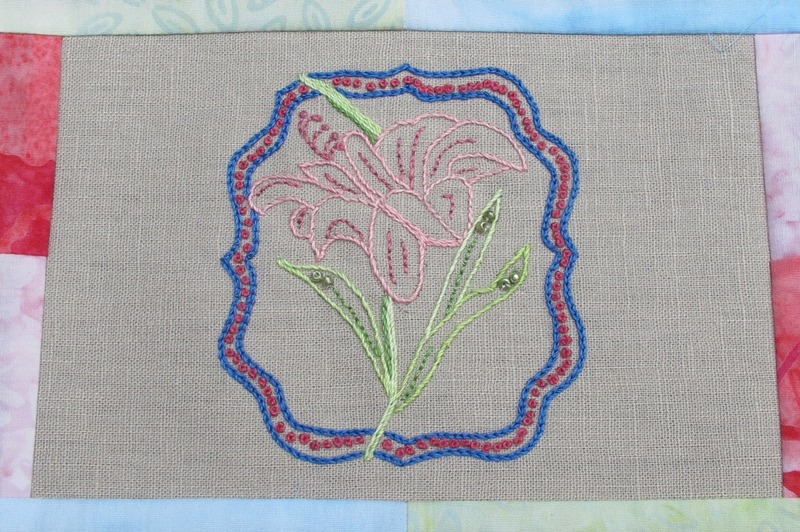 I have used her pattern The Square Flower for the border blocks. It is definitely a TREAT to finish another UFO. 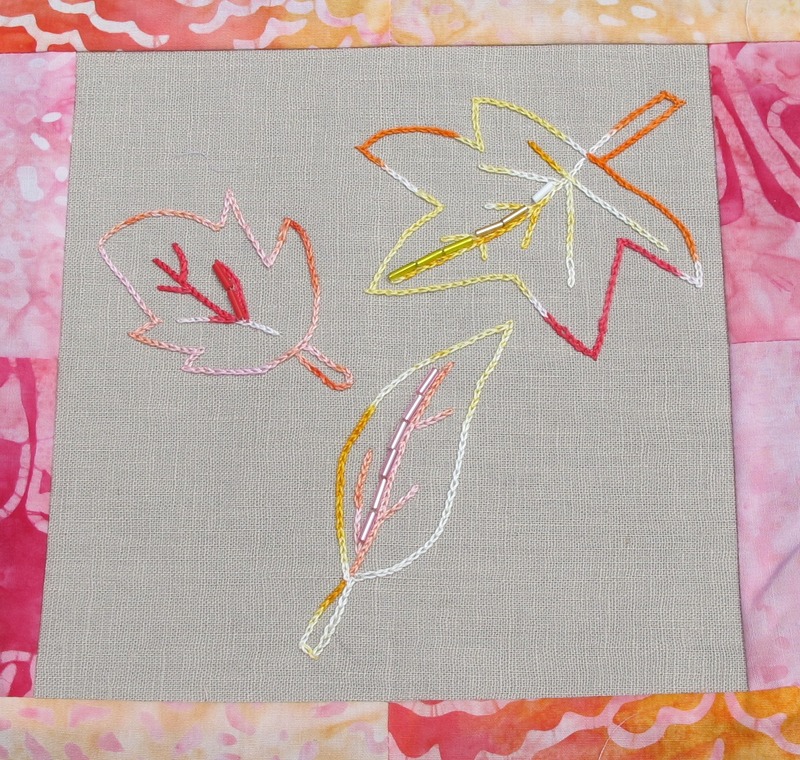 It is never too late to start your version of these embroidery blocks. They are still available from AURIbuzz ‘Meet the 2012 Aurifil Designers‘. 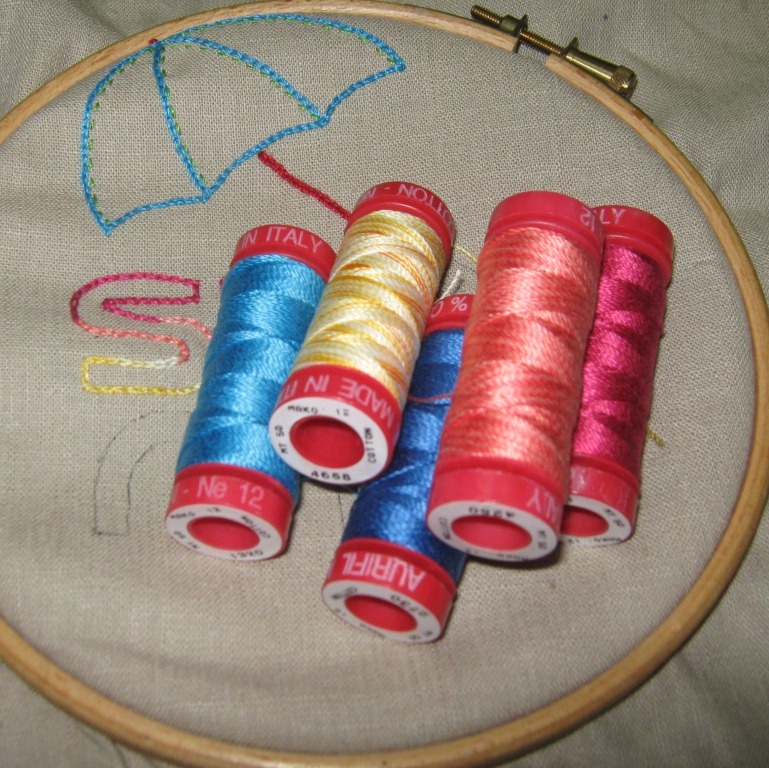 One of the great treats that comes from being a guest speaker, taking the Aurifil thread products story to Guild meetings, is the opportunity to see the members’ show & tell. 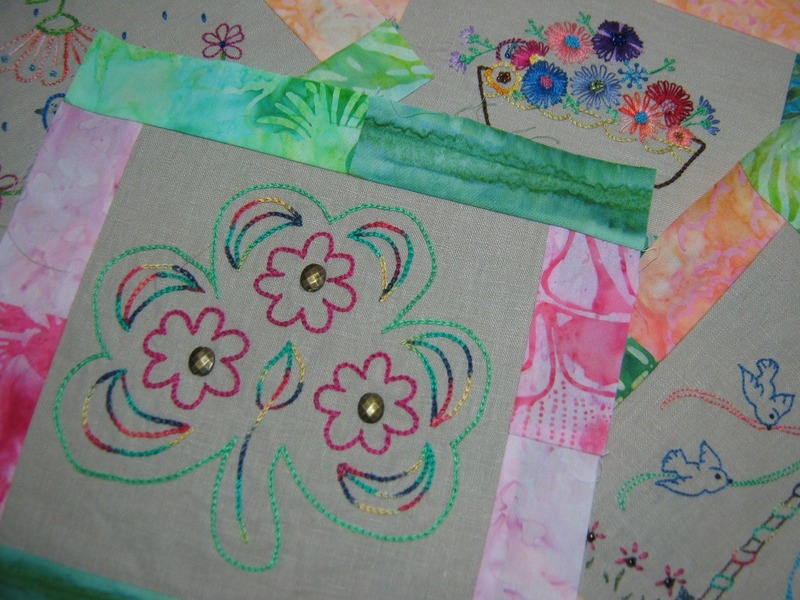 I love seeing the wide range of patchwork, and textile talent, that the members share with each other at their meetings, and each guild is always different. 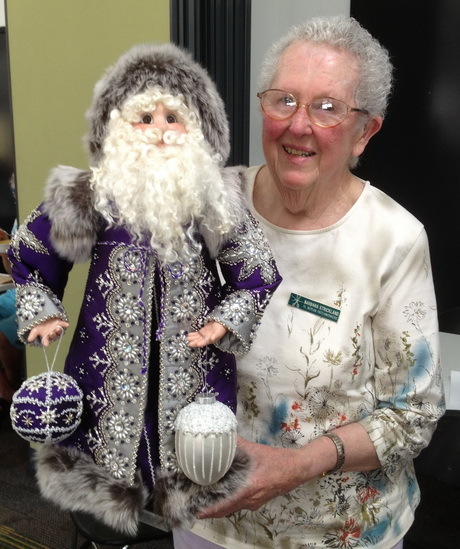 This incredible doll, made by Barbara Strickland, was a highlight at the show & tell at the Point Nepean Patchwork Guild meeting in October. When Barbara gave me permission to share my photo she said that she made this doll, and all the clothes and accessories, at classes with Helen Pierce in Mornington (Victoria). You can see that the St Nicholas doll is quite tall and his jacket, and the eggs, were beautifully beaded. Just stunning! 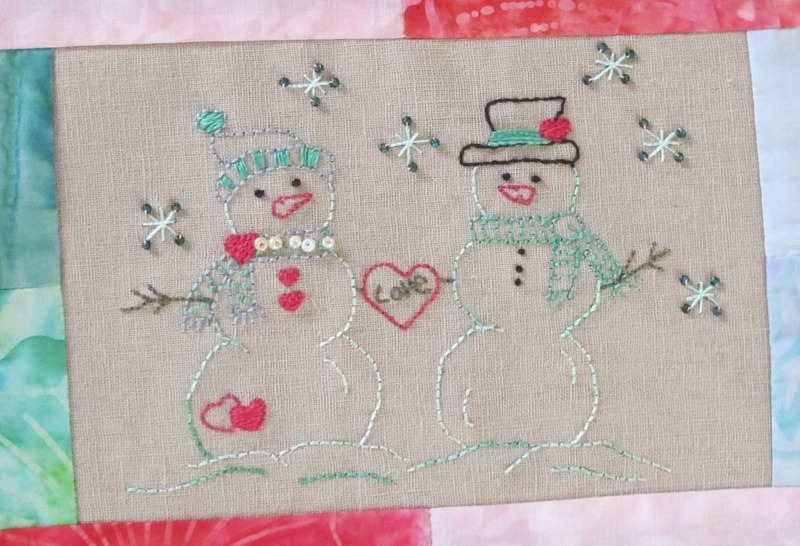 and a beautiful Christmas decoration. When I am immersed in a project and I have ideas bubbling around in my head, I am ANYTHING but patient. Even while I am stitching my blocks together I am auditioning design ideas, in my mind, considering colour combinations and border variations. 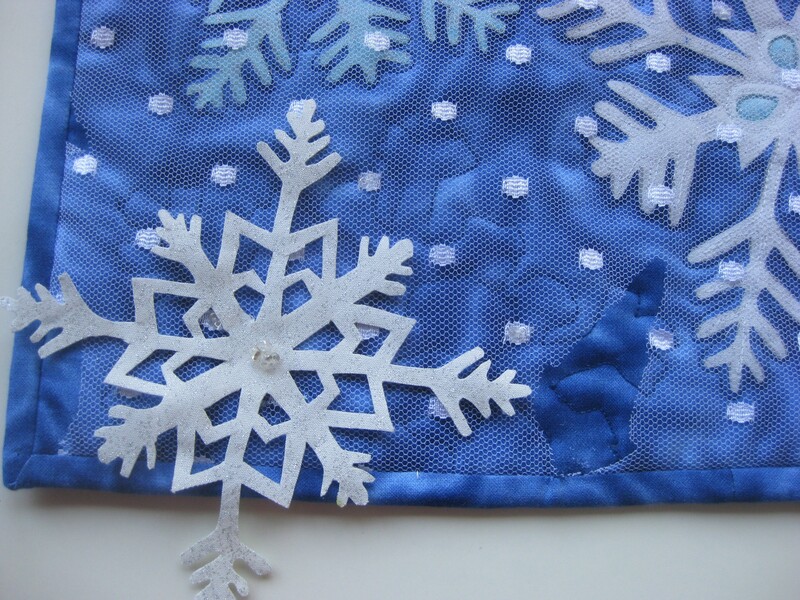 When I completed the December block of my Aurifil 2012 BOM I just couldn’t wait to see how Pat Sloan was going to put the blocks together. 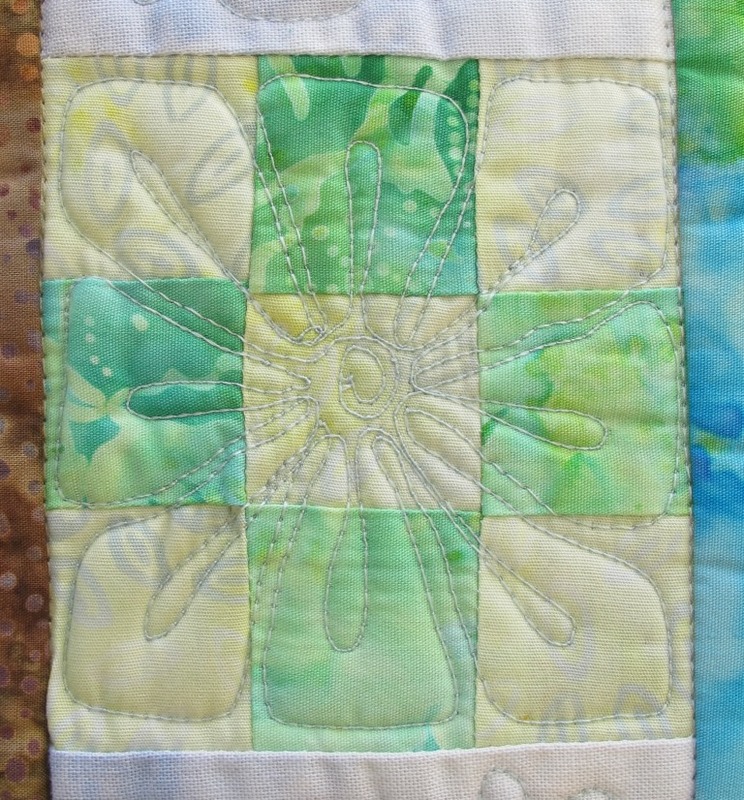 So, I have finished my Aurifil 2012 blocks using my soft rainbow palette as I still had fabric left over. I began to measure and cut and piece…. 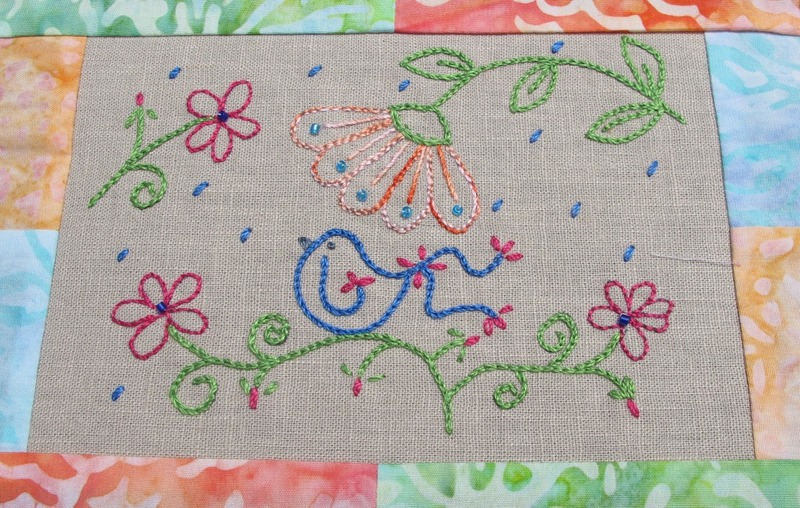 I like the result and I have ample space in my borders for quilting or more decorative embellishments with my Aurifil 12wt thread collection. 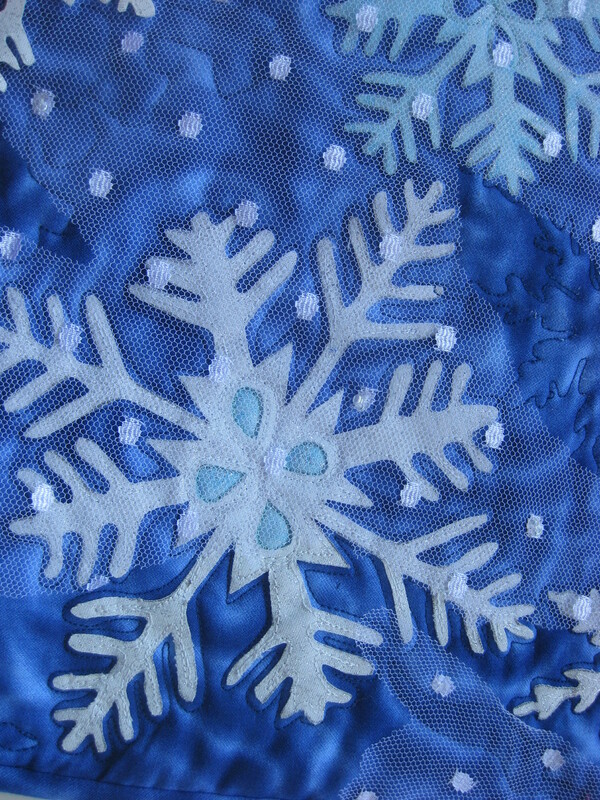 When it is quilted and bound I will share a picture later this year. 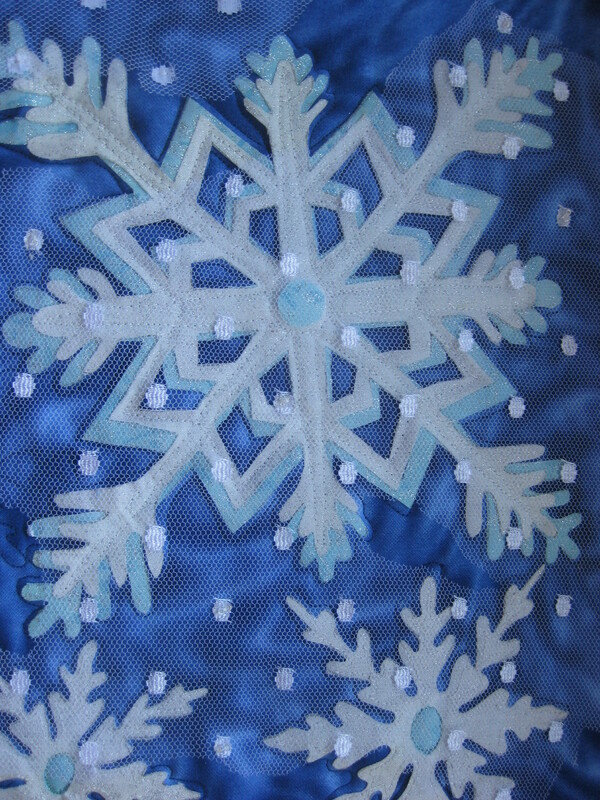 Want to see more finished quilts? 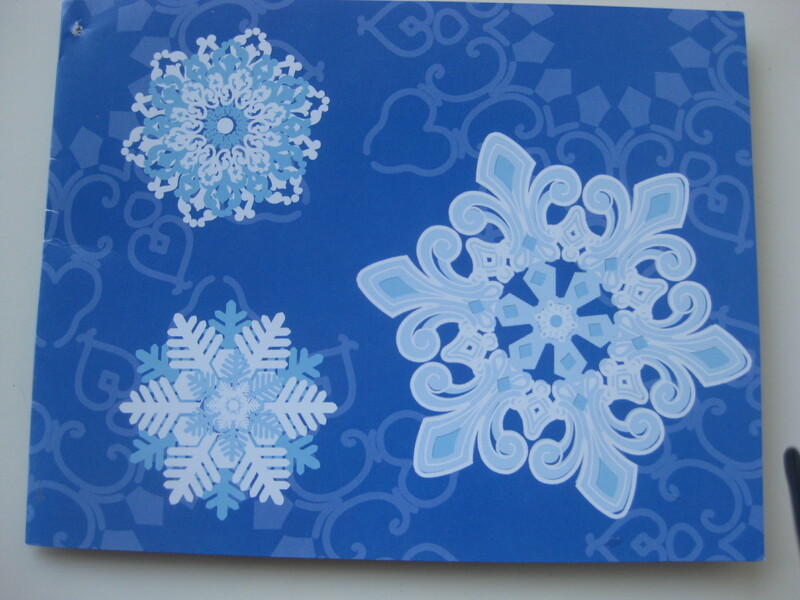 Didn’t collect the patterns in 2012? 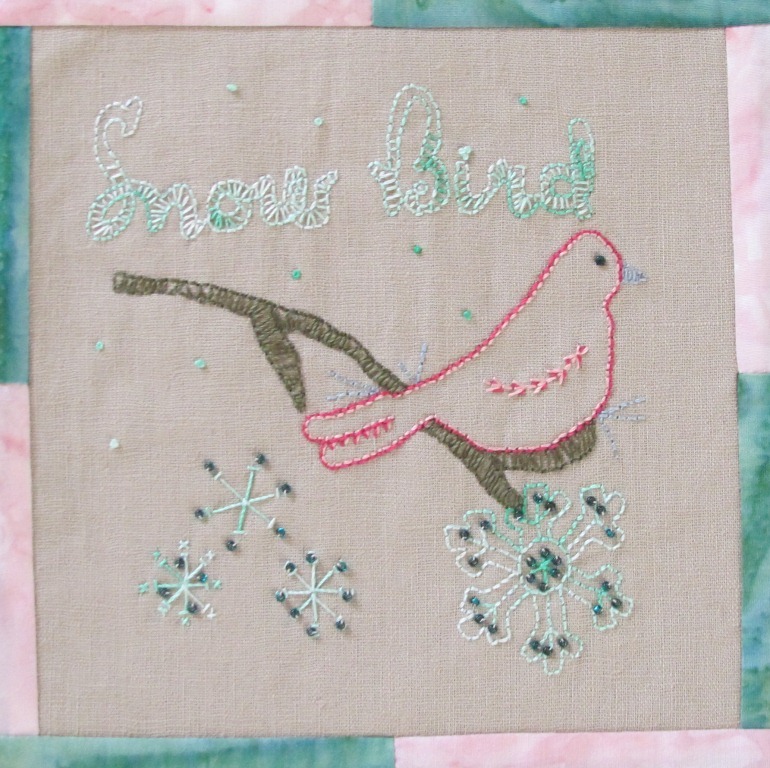 It is too late to enter the 2012 competition, but it is not too late to download the patterns to make your own version of the quilt. 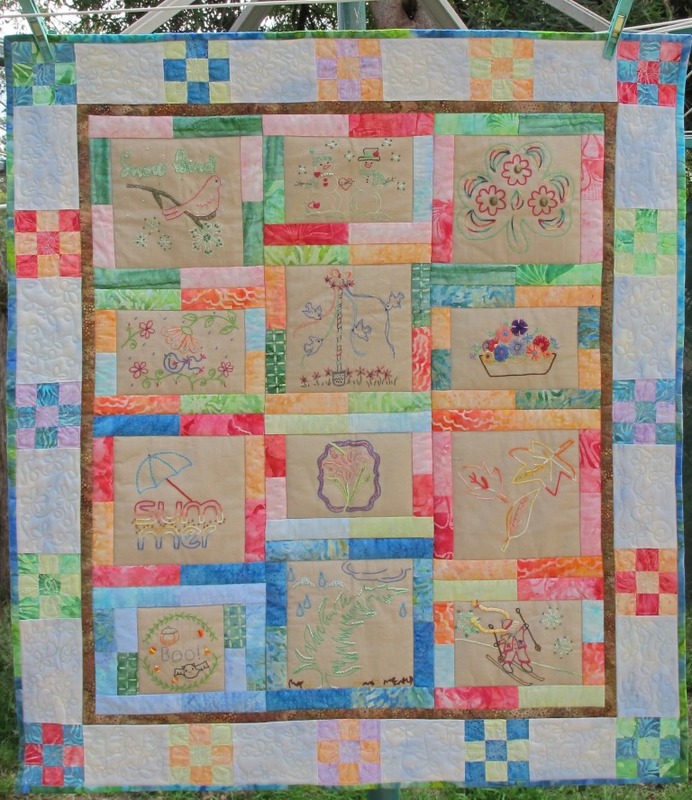 Don’t get left behind this year, start collecting the 2013 Aurifil Designer of the Month blocks now. We also have a BOM, “A Modern Welcome”, beginning here on our blog in the first week of March. We hope you will join in the fun…..you just have to be patient. 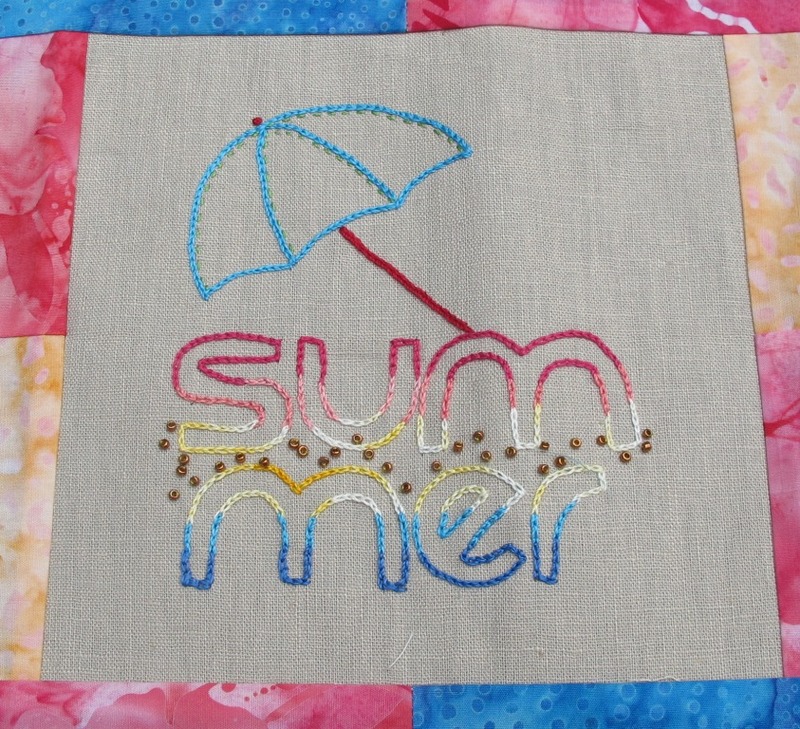 The Aurifil Block of the Month, presented by Pat Sloan, is past the half-way point and I have finished the block for July; Summer is the contribution from Sarah Fielke. 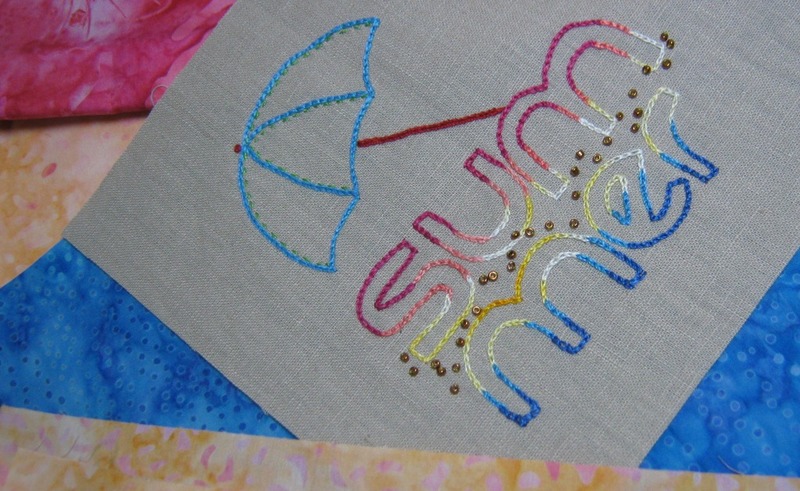 I know we are in the middle of winter here in Australia, but I have enjoyed stitching beach umbrellas and thinking of the sand between my toes as I attached my golden, sandy coloured beads……I have employed the attitude…”Why make a French Knot when I can use a Bead”! 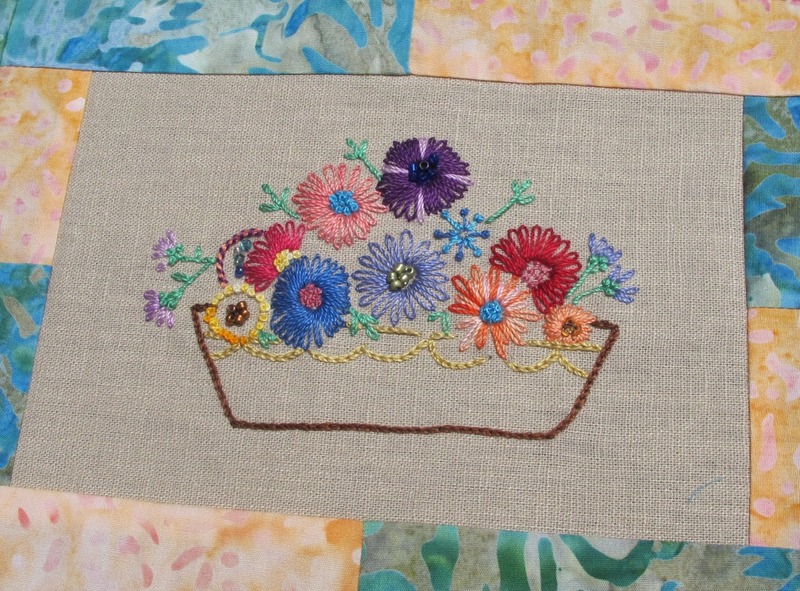 I loved using several variegated threads! 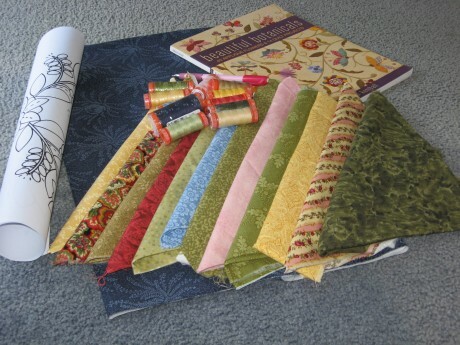 As a reminder…I began my Aurifil BOM with a collection of seductive fat quarters from Timeless Treasures. 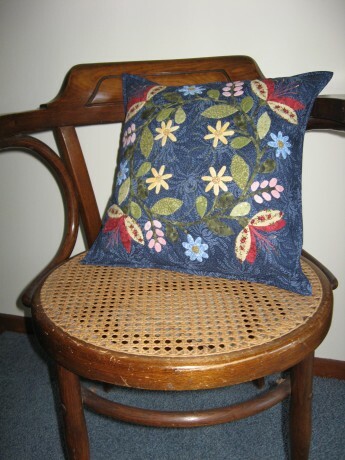 I know Pat Sloan began with a different, luscious selection of fabrics. 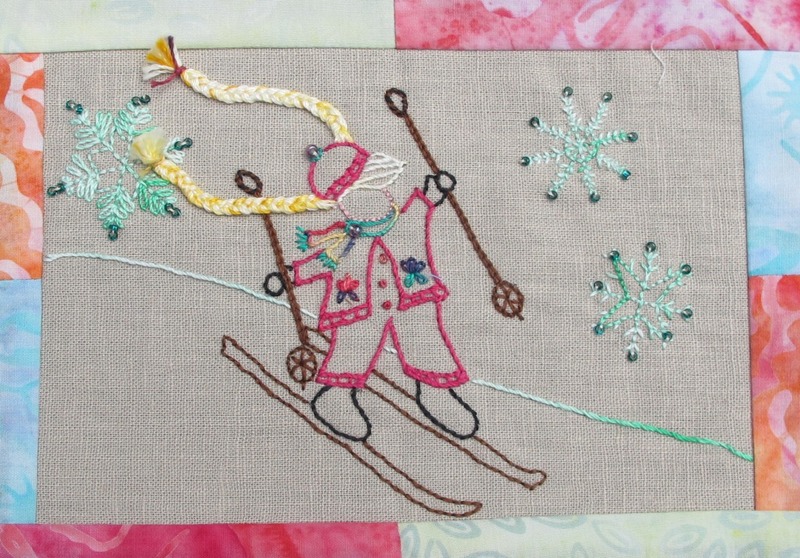 And Jenny is doing hers on wool with Aurifil’s fabulous Lana wool. Here are a few snaps of my earlier blocks. I will indulge myself with a few days of feeling quite pleased with myself for being all caught up and waiting for the next installment …what new project can I start in the meantime??? 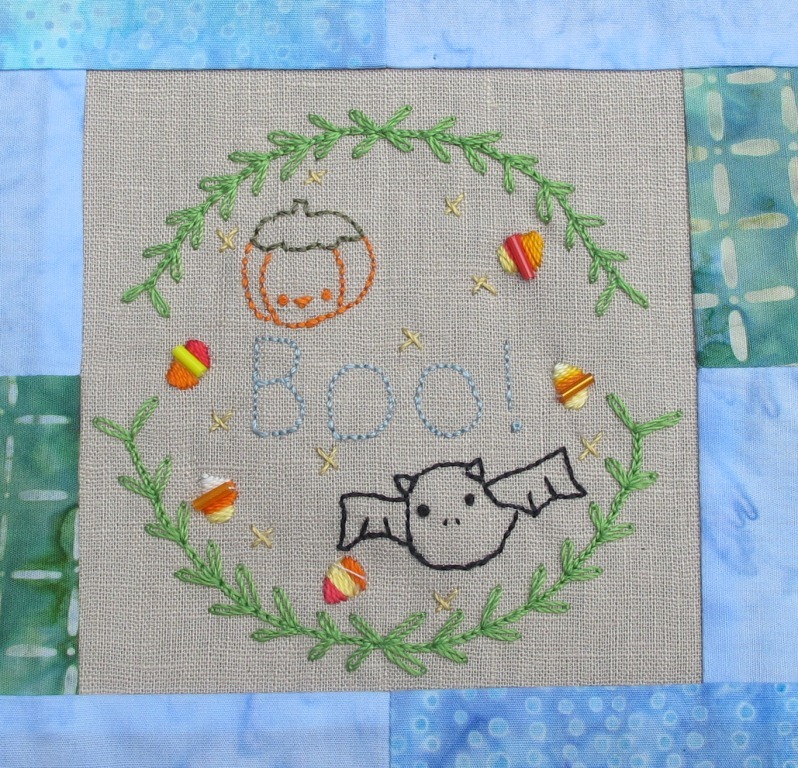 How to have fun playing with variegated thread. 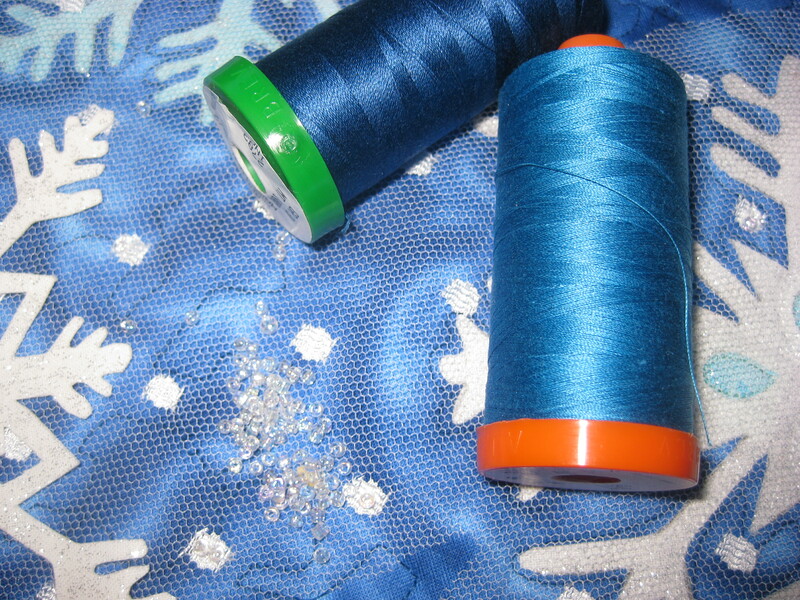 This month, our feature thread from the Aurifil range is not really a thread, more like a dyeing technique, as we are talking about variegated colours. 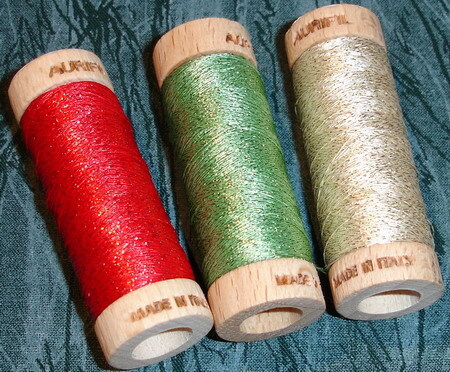 You will find a good variety of variegated threads in the Cotton Mako’, Lana & Aurilux ranges. 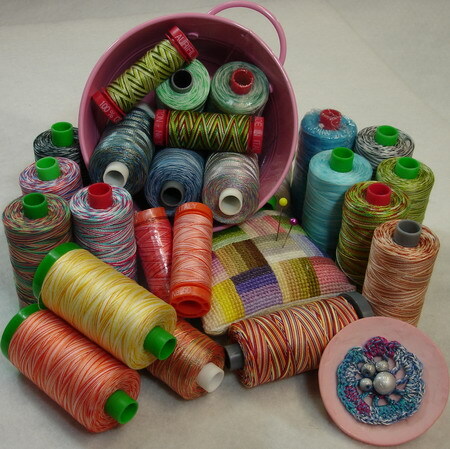 There are some multi-colour variegations, but mostly the variegations consist of one colour that runs from light to dark, and back, along the strand of thread so even the Brillo threads could be mistaken for variegated colours as the metallic thread glitters light & dark. 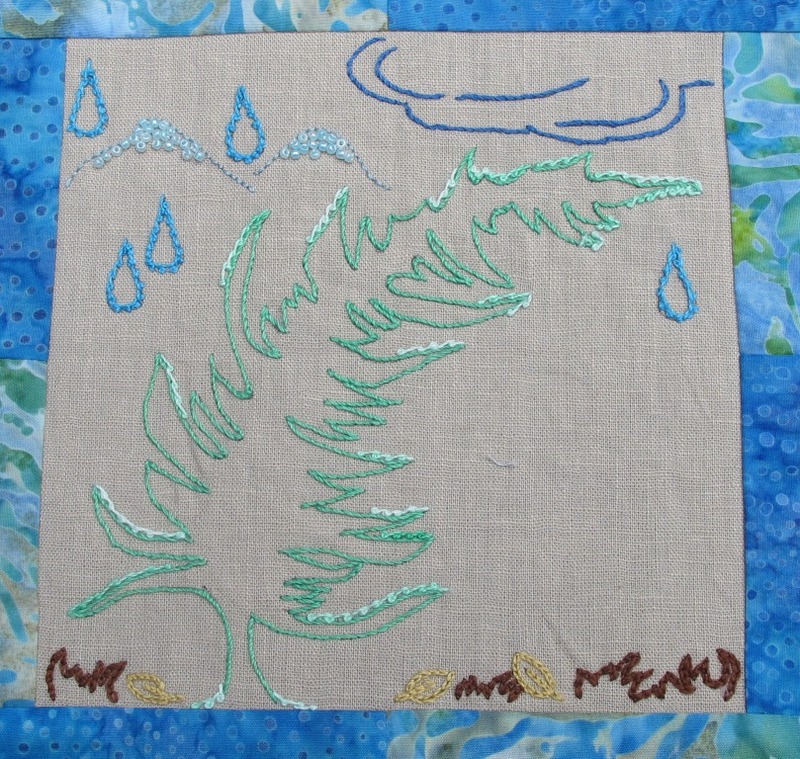 The self variegated threads create beautiful water colour effects when used for thread painting, a topic that I will discuss later this month. 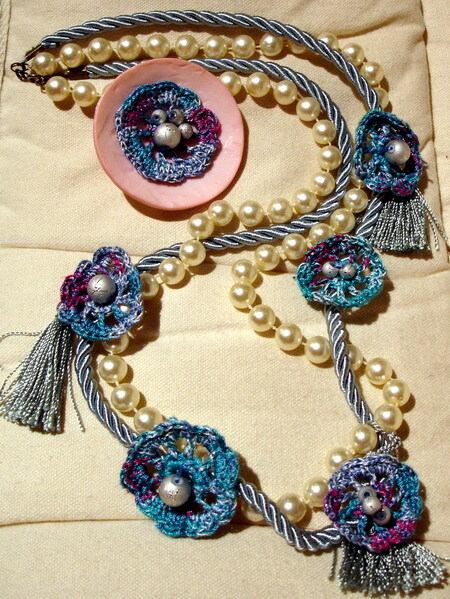 Late last year we featured our crochet projects using the Lana thread. When we did this it set me thinking about what would happen if we crocheted with the Cotton Mako’ 12, which is a similar thickness to the Lana thread. 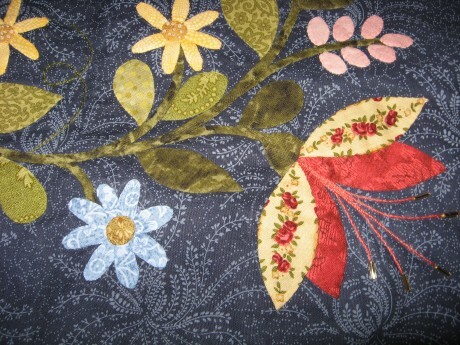 I also turned one flower into a brooch by stitching it on to a large button back. Such simple projects, but they get compliments every time I wear them. If you want to have fun making your own crochet flowers you will find our crochet instructions in the download box to the left of the screen and you can purchase Aurifil threads from our online store.